As MacStories readers know, I migrated from iPhoto to Dropbox storage for my photos in 2012 and haven't looked back since. I store all my photos and videos in Dropbox with a Year -> Number of Month - Name of Month system that sorts all photos within month folders by creation date. The year-based organization made the most sense to me when I was moving out of iPhoto, and the trick of using Year - Number of Month - Name of Month lets me retain the basic sorting capabilities of year/month numbers alongside readable month names. I don't organize photos by event (e.g. “Christmas dinner 2013”), but I know that Bradley advocates this kind of smart grouping and it's something I'm considering. I don't have a dedicated camera; all my photos are either taken on the iPhone 5s or, if absolutely necessary, with the iPad. In spite of the improvements Apple made to the Photos app on iOS 7, I don't keep all my photos on iOS; in fact, I tend to achieve Camera Roll Zero as often as possible. After I've taken a bunch of pictures on any given day, when I'm at home (usually in the evening) I fire up CameraSync and let it upload all new photos to Dropbox. It supports real background, location-based uploads. In CameraSync, you can configure multiple locations based on your WiFi connection, like “Home” and “Work”, and when you'll arrive at one of those locations CameraSync will be triggered in the background, even if the app is not open, and it'll start uploading. If I've only taken a few photos, CameraSync's background upload won't time out and it'll tell me that the upload is done with a notification. Again, the app can intelligently upload new photos it recognizes in the Camera Roll; once the upload is done, I delete those photos from my device. CameraSync can upload to a specific folder other than the default “Camera Uploads” one in Dropbox. I do use that folder, but I like having the option if I'll ever change my mind. It's got photo quality settings; I use “Full”. It lets you choose iOS albums to sync photos from if don't just want to upload from the Camera Roll. I've been using CameraSync for over a year and the app was updated for iOS 7. It's Universal and it provides more flexibility than the official (but free) Dropbox app. 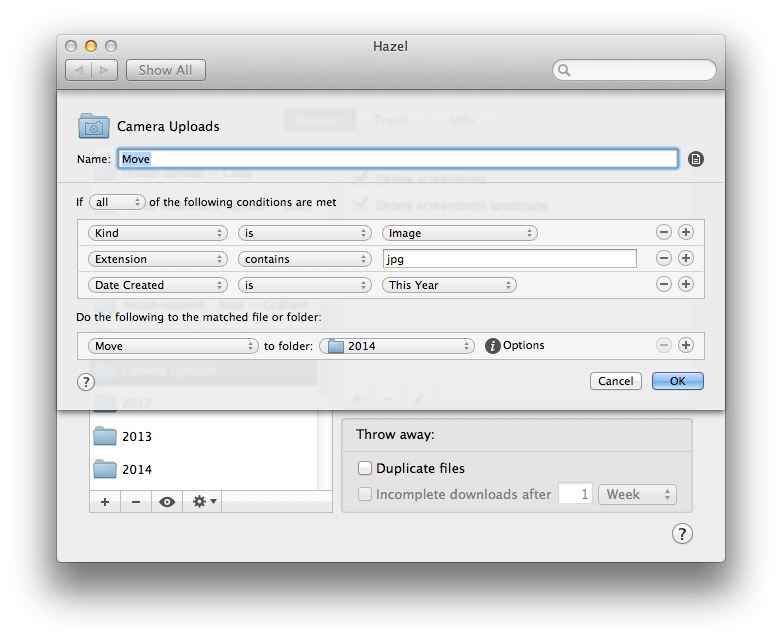 All my photos are sorted automatically by Hazel, which is running 24/7 on my Mac mini. 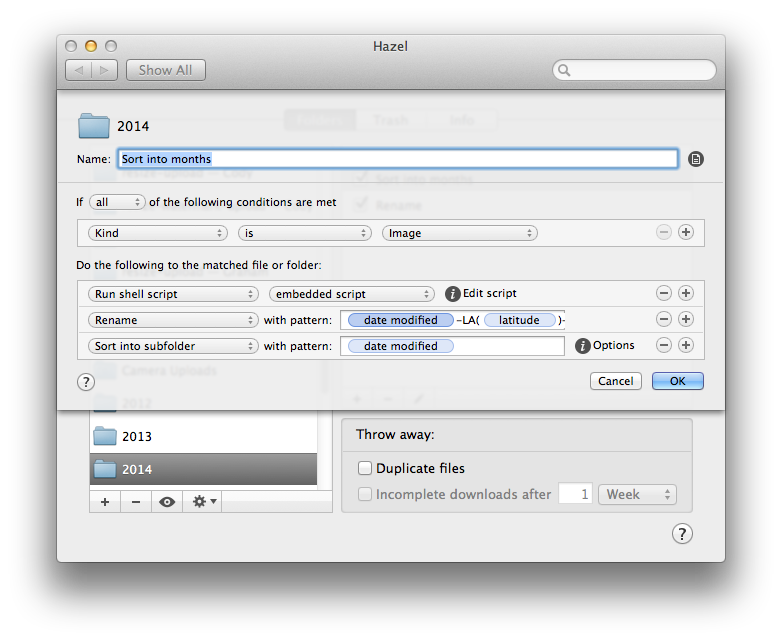 Hazel is the key element of my photo management workflow and I wouldn't be able to organize my photos without this fantastic utility. 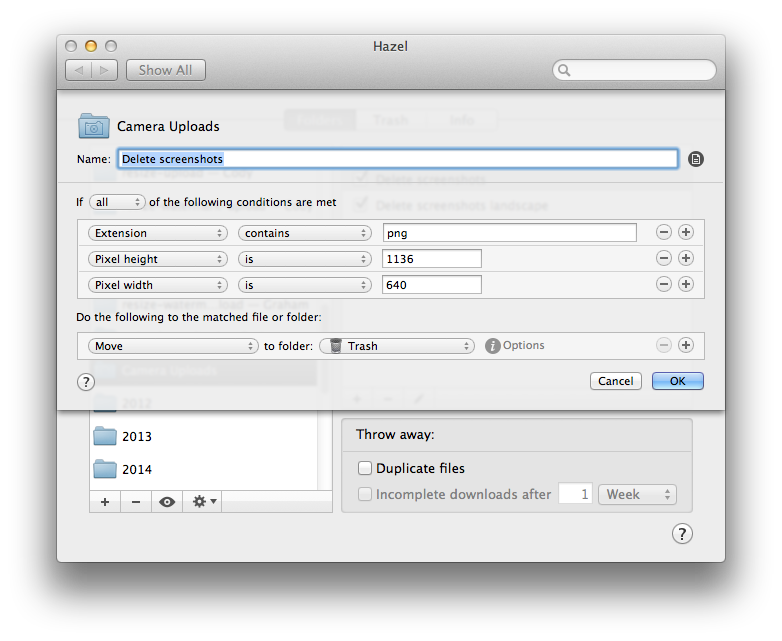 Hazel does a couple of things to make sure my photos are properly organized. First, it watches the aforementioned Camera Uploads folder for new photos. Because Hazel runs its rules from top to bottom, I set up two actions above the main “Move” one that check for screenshots (in both portrait and landscape resolutions) in case they manage to find their way into my Dropbox for some reason. With screenshots out of the way, Hazel then proceeds to take JPEG photos and move them into a sub-folder for the current year. This is the only manual part of my workflow: every year, I have to create a new folder in my Dropbox like I did last week for the “2014” folder. I could probably automate this process, but I'm lazy. If a video is found instead of a photo, it is renamed (more on this in a bit) and moved to a general “Videos” folder. The meaty part is the “Sort into months” action. First, it takes care of re-adding photo metadata that are unfortunately stripped by CameraSync when photos are uploaded to Dropbox; the script is the same that I shared in 2012 and it still works reliably. Then Hazel renames each photo using a Date Modified - Langitude - Longitude pattern that puts a date/time stamp and coordinates right into the file name. I end up with ugly, long file names for my photos, but I don't care because a) I never have to see file names when viewing photos and b) if the day ever comes, I'll be able to access this information in the file name with a script and parse it. Once photos are given their metadata back and renamed, they are sorted into month subfolders. 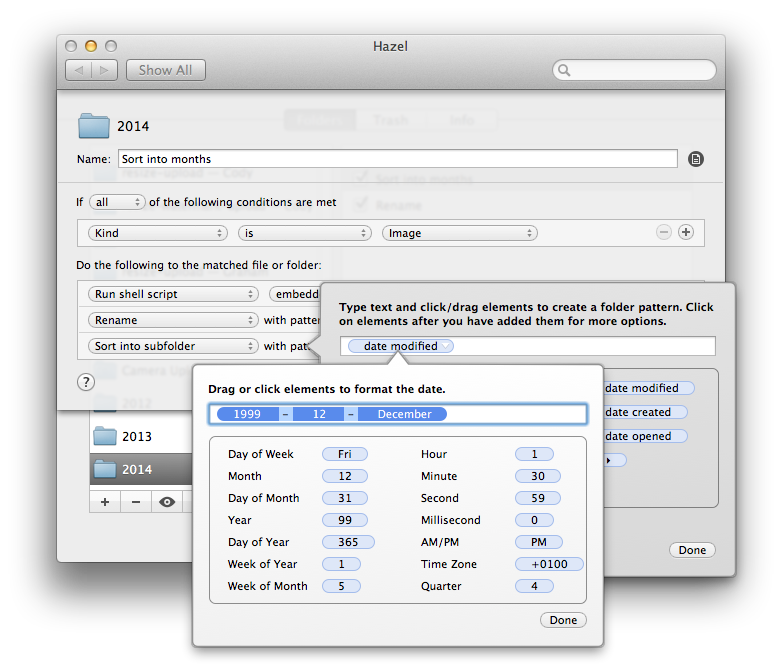 The trick here is to use a Date Modified token and click it to edit the underlying date pattern so that it'll be formatted according to your preferences (in my case, Year, Month, and Month Name separated by hyphens and spaces). With this action, my photos are done – they're in my Dropbox and I don't have to think about them anymore. To view my photos, I primarily use Unbound for iOS, an app that I've recently reviewed. Unbound is a good Dropbox-based photo viewer that you can connect to your Dropbox account and use to browse folders and albums. Photo thumbnails are loaded in low-res for speed purposes, but the full-res version is downloaded from Dropbox when you tap a photo to view it. Thanks to my sorting system, folders for years and months are correctly sorted in the app. Unbound has built-in Dropbox sharing capabilities to generate shareable links and it can also hide folders you don't want to see or cache individual ones locally for offline access. Unbound does a great job at abstracting the filesystem structure and presenting photos as if they were part of traditional iPhoto albums; alas, it doesn't have smart filters to view photos by location, like Photowerks does for local photos on your iOS device. If I want to view photos on my Mac, I use the Finder in Grid view – a tip that I first got from Dr. Drang. Because my photos are inside folders on my Mac mini server, I can use desktop uploaders from third-party photo services to try them out with minimal effort. I've been experimenting with Loom and Picturelife after the sad demise of Everpix (which I loved), and while I know that Bradley recommends Loom as a Photo Stream alternative, I'm leaning towards Picturelife as an Everpix-like solution. There are several other options that include family sharing, friend streams, ratings, captions, and discovery. I'd like to see better consistency of the overall experience across the web and iOS clients. There are several aspects of my photo management workflow that I seek to improve and streamline this year. First and foremost, I'd like to get rid of the script to fix metadata with Hazel and have a version of CameraSync that can automatically upload my photos at night, on WiFi, with no location workarounds and background upload timeouts. I need to add a second layer of online backup to my photos. While I'm pretty sure that Dropbox won't be going away any time soon, I'm thinking about something like Backblaze or Arq to mirror my Dropbox to another cloud; I'll probably end up using both and have three layers of online storage plus local backups of my Mac done with USB drives and SuperDuper. I'd like to get a Thunderbolt drive to speed up local backups. I want to improve the way I organize and sort videos. Right now, they're sitting in a single folder and that's it. A solution would be to sort them into subfolders like I do for photos. I'd like to see Apple completely revamp iPhoto and Photo Stream to offer simple, unlimited iCloud photo storage built into the iOS Camera Roll with no requirements for local storage. Ideally, their solution would store full-res, untouched versions of photos on iCloud, caching them at full-res for offline viewing if needed. I envision an single photo library based on iCloud that's universally shared across iOS apps and that has features like private and shared albums, date and location filters, full-featured metadata support, search, Faces, and flashbacks with a consistent interface that has feature parity across devices with no photo size limitations or WiFi/Cellular restrictions. It needs to “Just Work” and I'm probably dreaming. If Apple can't do this, I'd like to see either Loom or Picturelife tackle this problem. I need to come up with a way to store edited photos alongside original files with a system that makes sense to me. I don't normally edit my photos, but I've been playing with VSCO Cam and I now see what the recommendations were all about. But how can I organize photos that have been edited alongside the originals? The limitations of iOS' file exporting mechanism don't make this easy, but I think it's doable. It would be interesting to see Dropbox become a key player in the photo management space in 2014. Many people store their photos in Dropbox and yet we have to rely on solutions like Hazel to sort them automatically; the Dropbox app is fine to view a list of photos, but it's not ideal. Wouldn't it be great if Dropbox treated photos and folders full of photos more like photos and albums rather than documents? I plan to make more photo books with iPhoto this year. I made one for Christmas from my iPad and I gave it to my girlfriend; we were both impressed with the quality of the book and, when I told her I created it from the iPhoto app for iOS, we realized just how amazing of an idea it is. I'd like to see more font and text controls, though. Last, as per David's suggestion, I'm going to play with shared iCloud photo streams for family photos. I hadn't really considered this option before, but it seems like the sort of handy feature that I could convince my parents to use without going insane.